The last spot in the Final Four is up for grabs today in Parking Madness, our hunt for the Most Improved Parking Crater in America™. Minneapolis overcame Oakland for the first semifinal spot, and Pittsburgh topped Houston for the second. You can still vote in yesterday’s matchup, Providence vs. Indianapolis. Providence is currently enjoying a pretty significant lead, but Indianapolis’s transformation is pretty stunning as well. In the end, only one of these vastly improved urban places can be named the best former parking crater in America. And your vote will decide. Today’s matchup features Toronto vs. Tampa. Let’s get to it! This submission comes to us via reader Dave Thom. At the time, buildings weren’t just knocked down in order to be replaced with newer structures, but to sit in limbo before development eventually proceeded. 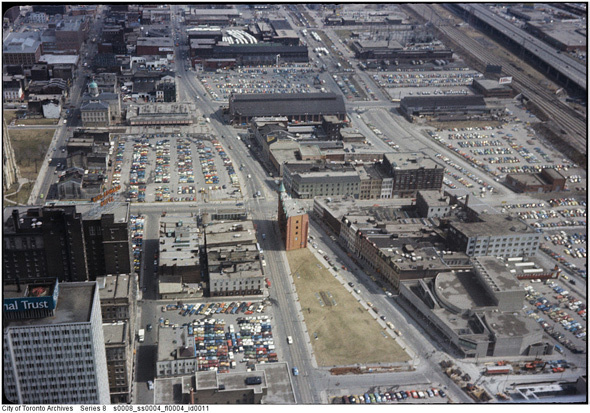 Perhaps the best example of this involves the former Board of Trade Building, located at Yonge and Front streets, which was knocked down in 1958 only to sit vacant (save for a few parked cars) until construction began on the EDS Building in the early 1980s. 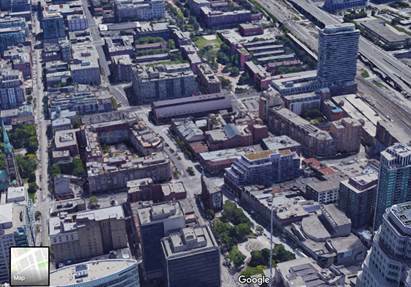 Most of the empty spaces in these images have since been filled via Toronto’s various real estate and development booms, though some not until more recently than you might think. According to Thom, the whole city has seen this kind of upward growth over the last two decades. Most of the awe-inspiring parking craters featured by BlogTO have since been filled in to make Toronto the walkable, global city it is today. It is really cool to see parking crater infill of this scale in a Sun Belt city like Tampa. The below photos show the parking crater infill that will be called Water Street Tampa. This mixed-use megaproject will include 3,500 apartments and condos and 1 million square feet of retail and entertainment space as well as 13 acres of public green space. Vertical construction has begun on nine buildings; cranes stretching over Tampa’s waterfront. The development will replace some 16 blocks of parking lots, crating a walkable environment that specifically aims to limit the presence of cars and give pedestrians broad latitude. 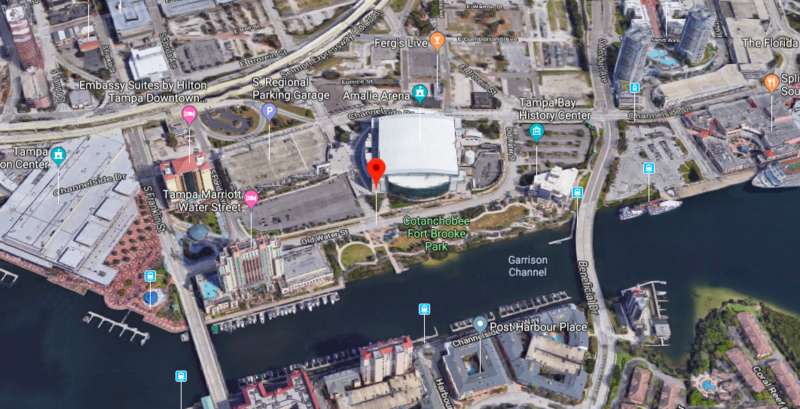 The project is being developed in part by Tampa Bay Lightening owner Jeff Vinick, a key supporter of Hillsborough County’s recently passed 1-cent transportation tax, which will fund transit and complete streets improvements across the region. Vote for your favorite to go on to the Final Four below. A parking crater than turned into a whole neighborhood in Houston competes with a beloved park in Pittsburgh. Incredible transformations in Providence in Toronto. But only one can go to the championship match. It's a matchup for the ages (well, not really): A small building in Albuquerque vs. a major redevelopment of a big part of Tampa. 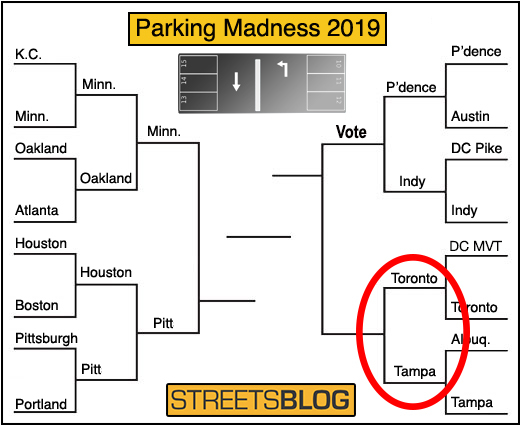 Parking Madness 2019, Final Four: Pitt. vs. Minn.
Pittsburgh's Schenley Plaza vs. Minneapolis's Downtown East. Which former parking crater is championship worthy?